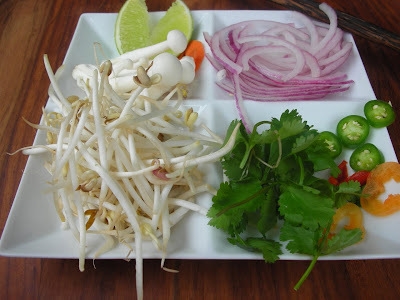 ShowFood Chef: PHO is "Fuh?" 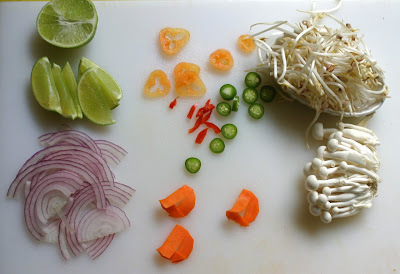 - Daring Cooks October PHO-N! 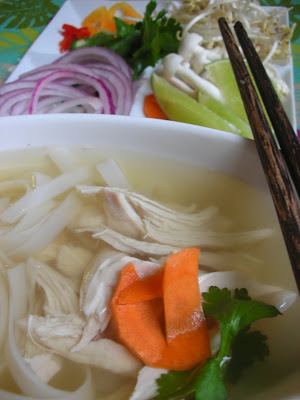 This month's cooking challenge with the Daring Cooks was to make the Vietnamese Chicken Soup known as PHO (pronounced "fuh?") GA. I'm not sure how you say "OH MY GOSH THIS IS TASTY" in Vietnamese, but you get my point. I've been getting to know Jaden in the virtual world of blogging and twitter, and hope to meet her in person soon. She's one of those gals who makes you feel that you're in her circle of friends immediately; never too busy to answer a question, return a gesture, offer generous help. Her experience and talent is obvious and I'm betting her new book will be hugely successful. 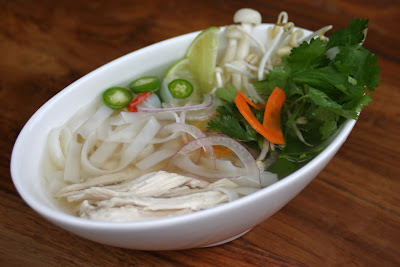 So, it was no surprise to find this PHO GA recipe to be simple, authentic and full of warm flavor. There are a few secrets to this dish: toast the spices, roast the onion and ginger, use real fish sauce, and simmer on low for a good length of time. Your reward will be a light amber pot of cozy soul-full soup that you and your friends/family can customize with the fresh add-ons: chicken, cilantro, mushrooms, carrots, chilies, bean sprouts, lime slices, etc. After reading a little about the history of this centuries old dish, I can appreciate how many variations have evolved. In the poorest of times and villages this soup often had no meat, or used less cuts, and certainly was served in smaller bowls than Americans are used to. I feel sure this will become a go-to for my family and friends. 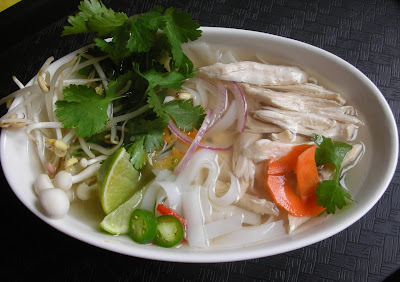 The recipe below is a quick version (included in the book), and the longer version (which I made) that includes making your own Pho Chicken Stock (which I think makes all the difference in SO many foods) can be found on Jaden's site here: Steamy Kitchen. 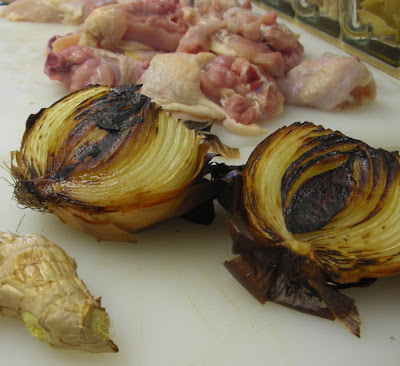 To make the Chicken Pho Broth: heat a frying pan over medium heat. 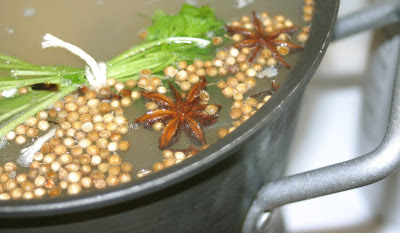 Add the coriander seeds, cloves and star anise and toast until fragrant, about 3-4 minutes. Immediately spoon out the spices to avoid burning. In a large pot, add all the ingredients (including the toasted spices) and bring to a boil. Reduce the heat to medium-low and let simmer for 20 minutes, skimming the surface frequently. Use tongs to remove the chicken breasts and shred the meat with your fingers, discarding the bone if you have used bone-in breasts. Taste the broth and add more fish sauce or sugar, if needed. Strain the broth and discard the solids. Ladle the broth into bowls. Then divide the shredded chicken breast and the soft noodles evenly into each bowl. Have the accompaniments spread out on the table. Each person can customize their own bowl with these ingredients. To go along with the October Challenge; an original Dessert WonTon Recipe (or 2 or 3). Brush each WonTon with melted butter. Sprinkle just the centers with a large pinch of Cinnamon/Sugar. Roll up tight, from corner to corner; just before the end, brush the edges again for a good seal (you may opt to replace using more butter with water at the end for a seal). In a large, deep, heavy skillet; heat about 2 inches of canola oil to 325F. Fry each WonTon stick, turning to brown evenly, just for a few moments. Using tongs, remove and drain on paper towels. 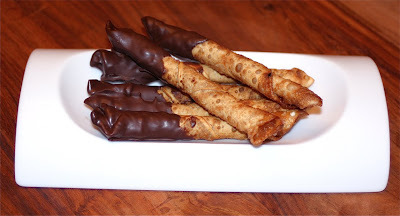 Dip tips in melted chocolate and place on parchment to set. 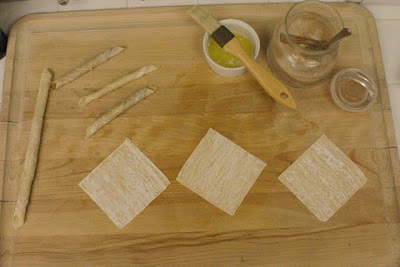 Cut each Wonton Wrapper into strips of about 1/4 inch wide. 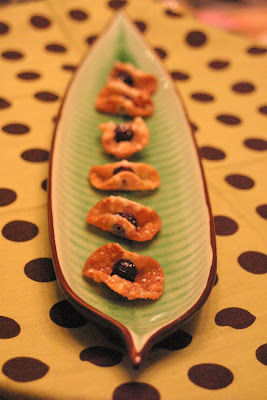 WonTon Blueberry Bonnets Using a 1 1/2 inch round cookie cutter, cut out circles from each WonTon wrapper. Fold each circle around a blueberry and secure with a toothpick. Drop the toothpick skewered WonTons into the heated oil at 325F til gently toasted. Remove with tongs and drain on paper towels. Remove the toothpicks. While warm, sprinkle with Powdered Sugar and serve. I've typed myself into hunger - MO-PHO-Fuh-ME! a very lovely dish. I always love noodles in soup. Love all of the wontons - such fun ideas =D. Plus, your pho looks wonderful!! Your Pho looks incredible and your PHOtos are stunning. 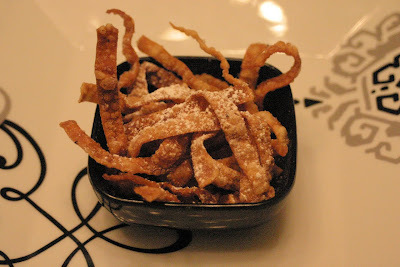 However, your wontons shapes and that cinnamon sugar have me drooling like crazy! Great job!! Ha! PHOto made me laugh. I love Pho!!! I have never made it but eat it a lot. I love how different the same recipe can be depending on the region and economic time. If History in school was based around food i probably would have paid more attention. Yummy as always!